Are you ready for some football? American football, that is, with all due respect to the rest of the world that considers soccer as true football. If you’re set to watch the big game on Sunday, February 3, you might want to look for some of the behind-the-action commodities. **The roof may appear to rotate open but it’s an optical illusion — it opens by the movement of eight “petals” that slide open in a straight line. **Petrochemicals are also protecting the athletes under that roof once the game starts. Today’s plastic football helmets are made from molded polycarbonate shells with foam padding — generally either polyurethane, polystyrene, polypropylene, or ethylene vinyl acetate on the inside. 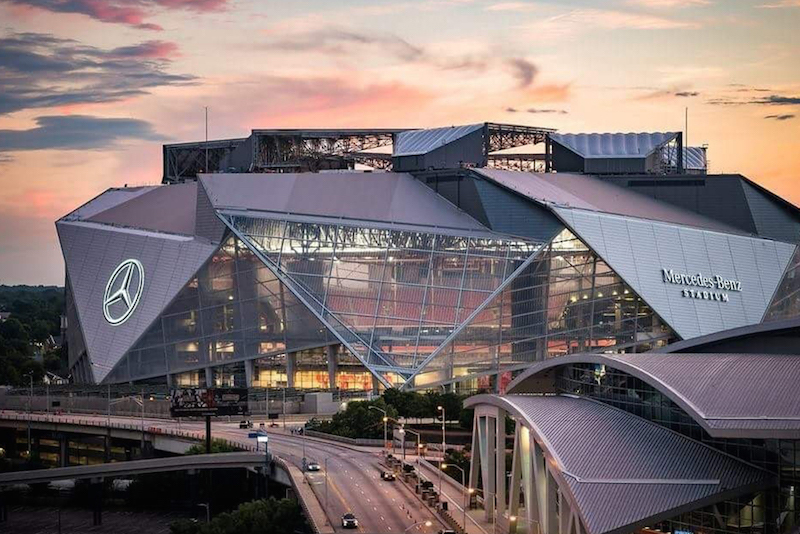 **The 1.6 million kW generated by the stadium are enough to power about 10% of the stadium’s energy consumption — the equivalent of approximately 160 households in Atlanta, or more than nine Atlanta Falcons home games or 13 Atlanta United home matches. In time for the Super Bowl, the stadium is committed to becoming a zero-waste venue by February 2019. Compostable paper soda cups and lids are used at all concession stands. Compost and recycling bins are clearly marked throughout the building so that fans can actively participate in the building’s sustainable efforts. Since its opening August 26, 2017, Mercedes-Benz stadium officials report it has collected 1.197 million lb of recycled material.